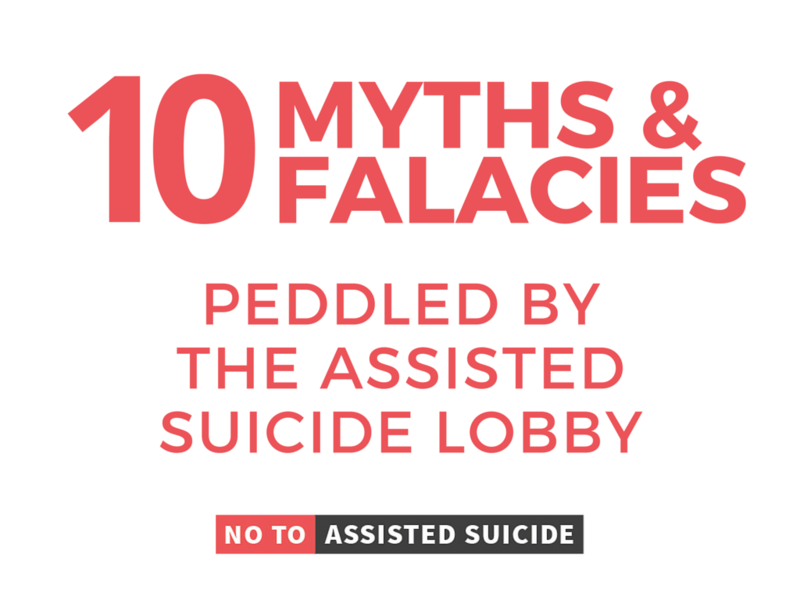 Top 10 Myths and Fallacies Peddled by the Assisted Suicide Lobby - No To Assisted Suicide - UK's campaign to stop assisted suicide. Assisted ‘dying’ is a euphemism for assisted suicide, which the assisted suicide lobby uses to hide the reality of what it’s asking for. The justification for it is that people who are terminally ill are dying anyway, so this just means assisting them in that process. But a very elderly woman in the last three months of her life could be said to be ‘dying’ too. If you poisoned her, even if she asked you to, would that be ‘assisting’ her to die, or killing her? The fact is, the Marris Bill would involve doctors enabling patients to kill themselves – that, by definition, is assisted suicide. If that were true, it would be illegitimate. Only Parliament has the right to change the law in this area, not the Crown Prosecution Service or the Courts. Also, if it were true, then why would the assisted suicide lobby want a change in the law? The reality is that the Director of Public Prosecution Guidelines properly allow for prosecutions to not take place if doing so is not in the public interest. This is not at all the same as decriminalising assisted suicide. 3. We have a ‘right to die’! No, we don’t. Suicide is decriminalised because putting a suicidal person in prison is neither compassionate nor constructive, but the right attitude society takes towards it is that it is a negative thing that we should discourage. We do not have a ‘right’ to take our own lives, and we do not have the right to be assisted to kill ourselves, or to be killed by someone else. Nothing in human rights philosophy or legislation establishes or supports any claim to the contrary. No, it doesn’t. Autonomy does not mean having the right to do whatever we want, because it is limited by what is good for others. Our autonomy to play loud music in our homes is limited by the effect it could have on our neighbours. Likewise, allowing assisted suicide might gratify some (usually very strong-willed) people, but it is nonetheless prohibited because of the negative effect it could have on others. People who are terminally ill, like other possibly vulnerable people (such as the elderly, the disabled) more often have a compromised autonomy, and could be unduly influenced by unscrupulous relatives, or even by what becomes a cultural pressure to commit suicide due to feeling a ‘burden’. The law rightly exists to protect such people from coercion. Not true. The law is working exactly as it should: it provides the strongest possible safeguards against the lethal abuse of vulnerable people, whilst containing the capacity for leniency. After assisted suicide a police investigation takes place, and if someone is found to have assisted suicide for nefarious reasons, they can be prosecuted. This forms a disincentive for others to do likewise. If someone assists suicide out of mercy, however, the Crown Prosecution Service may choose not to prosecute, or a Court itself may choose not to find the defendant guilty. Either way, society treats the subject with the grave seriousness it deserves, and balances justice with mercy. The law works, because it has both a stern face and a kind heart. Even if this is true, it is irrelevant. A majority of people have supported the death penalty in various polls over the last five years – from 65% to 45%. Few people would say that this fact, on its own, forms a justification for reintroducing capital punishment. As it happens, polls show that when a proper debate about assisted suicide happens, the ‘uncommitted, uninformed, and unconvincing’ support for assisted suicide (mainly given due to a superficial approval to the principle of reducing suffering) significantly decreases, as people think more deeply about the subject and recognise the dangers of introducing the practice. Regardless, what matters is not whether assisted suicide is popular, but whether it is a good idea. Actually, the best way to prevent suffering is to reform palliative care. Great Britain has possibly the best palliative care system in the world, and palliative care has developed to the point that physical pain can be taken away completely. Yet an independent review commissioned by the Government reported in 2011 found that of just over 470,000 people who die in England each year, some 355,000 require palliative care, yet only 171,000 receive it as a specialism. Surely rather than introducing death as a solution to the problem of physical pain, we should be working to perfect the palliative care system that we have, and which could, if enabled to do so, take that suffering away? 8. 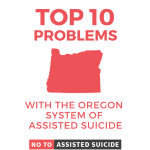 The system of assisted suicide used in the U.S. State of Oregon is a model for the U.K.
Oregon’s system of assisted suicide is not a good model, but one that is fundamentally compromised. Every year, the Oregon State Public Health Division brings out a report on how the ‘Death With Dignity Act’ (their assisted suicide law) is being implemented. In 1998, the year on which the first report was published, 13% of patients who were assisted to commit suicide reported fearing being a burden on others as a reason for their choosing to end their lives. In 2014, this was 40%. In Washington State, which has since adopted Oregon’s model and brings out its own reports, this figure was 59%. Clearly, the Oregon system does not stop the so-called ‘right to die’ becoming a ‘duty to die’ for vulnerable people. This is no model for the U.K., unless we really want to live in a country that has such a negative effect on the terminally-ill and other vulnerable people. The so-called ‘safeguards’ in the Marris Bill, are the same as those in the Falconer Bill before it – two Doctors checking that those presenting to be assisted in committing suicide have come to a “clear, settled, and voluntary” decision to do so. Yet the vast majority of people do not have the close relationship with their GP that would be needed for them to discern whether their patient is being unduly influenced to kill themselves. If this is true for the GP, it’s certainly true for a doctor who has only known the patient for a matter of weeks. The only other requirement would be that a High Court Judge determines that this process has been completed – an empty lip-service given that the process is as toothless as it is. So far from providing strenuous ‘safeguards’, the Marris Bill only gives a paper-thin checklist, that could not protect those most at risk. Only the current law provides for public safety and the welfare of the vulnerable. 10. There’s no ‘slippery slope’! If there exists a ‘right to die’, why are we recognising it for terminally-ill people, but not the elderly, the disabled, or the depressed? Surely, if we grant it for one group then it’s inconsistent not to eventually grant it for all? By the same token, if taking away physical suffering is an overriding consideration, then why isn’t relieving the existential pain of being paraplegic suffering from Motor Neurone Disease, or experiencing mental illness? Again, consistency would demand catering for these cases too. Yet many of these cases would not merely require an extension of assistance to commit suicide. They would require someone else, a doctor, to kill them – outright euthanasia. ‘Dignity In Dying’ (the former Voluntary Euthanasia Society’) might not advocate extending assisted suicide, or introducing euthanasia, but both eventualities follow from the logic of their arguments.